It is said that out of a thousand beings who become enlightened, only one becomes a master who is capable of individually guiding others out of the complexities of their personal illusions. Mada Eliza Dalian is one such rare being. She is an ancient soul, a modern day mystic, and internationally acclaimed master of healing and transformation. Mada is the founder of the light-speed Dalian Method™ for health and consciousness, best-selling multi-award winning author of two books; In Search of the Miraculous: Healing into Consciousness and Healing the Body & Awakening Consciousness with the Dalian Method: An Advanced Self-Healing System for a New Humanity, and is the creator of several meditation CDs. What sets Mada apart from other spiritual teachers is that she is also a gifted hands-on healer. What sets her apart from other healers is that she is not concerned with fixing symptoms of the ailments but rather with helping people heal from unconsciousness into consciousness. She is no-nonsense, to the point, and completely and utterly practical. She does not spend a lot of time talking about problems, abstract concepts and philosophies. Instead, she teaches people how they can practically and permanently alleviate the causes of their physical, mental, and emotional pain and suffering and discover the peace and joy of their eternal being. Mada’s own quest for truth began at the age of five when she witnessed her grandfather’s death. At that tender age she became aware of her own mortality and asked herself: Who am I? Where do I come from? Where will I go when I die? At the age of twenty-four, she came across the teachings of George Gurdjieff and Osho and her childhood questions were sparked back to life. At this time, she left behind her training in education and architecture and devoted herself to the search for truth and spiritual enlightenment. After years of focused meditation and introspection she was blessed with many profound experiences that led to the “ultimate” experience of awakening and liberation from the ego at age thirty-three. After integrating this profound experience into her daily life Mada reconnected with her childhood ability of being able to “read” with 100% accuracy the repressed thought forms and emotions repressed in people’s bodies and energies. She also began “seeing” the many interconnected layers of their unconscious that were causing the physical, mental, and emotional blocks, pain, and illness. Through her deep and life-changing work Mada has helped thousands of individuals to heal into consciousness and transform their “incurable” illnesses, depression, anxiety, and fear into health and self-empowered consciousness. She offers private sessions, self-healing seminars, online courses and retreats to help people heal their body, dis-identify from their ego-mind, and take risks to live life fully and fearlessly. 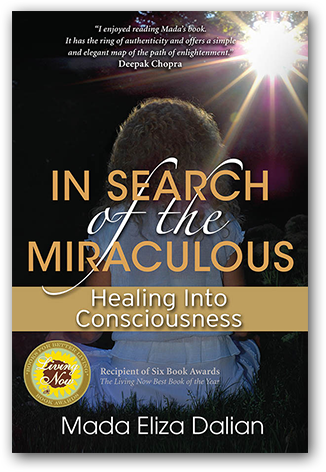 A detailed story of Mada’s journey can be found in the bestselling book In Search of the Miraculous: Healing into Consciousness. Read on how Mada created the Dalian Method™ (DM) in Healing the Body & Awakening Consciousness with the Dalian Method: An Advanced Self-Healing System for a New Humanity, the book & 2 CD box set.